Don’t be fooled into thinking this 3-reel, 3-row slot is basic or simple, because it’s anything but! NovomaticCasino.co.uk’s Jewel Action slot is a slot unlike any other: it’s generous, it’s different and it’s packed full of bonus features! 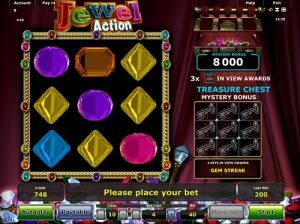 If you’re sick of feeling like each and every slot you play nowadays looks and feels exactly the same, then give Jewel Action a go – and we promise you won’t be disappointed. With sapphires, rubies, emeralds, diamonds and more, this sparkling slot is exactly what you need to play to brighten up your day. Not everything is completely new in Jewel Action, and you’ll be happy to know that there are some familiar features included to help you understand the unfamiliar ones! For one, your balance and winnings are clearly displayed for you at the bottom of the screen, on the left and right respectively, with your bet in the middle. You can change your bet amount at any time by using the plus and minus symbols to alter the coin amount and the number of lines you’re betting on. You can consult the paytable at any time to see how much each symbol is worth, depending on your bet, and to get more information on the rules of the game. Unlike many other NovomaticCasino.co.uk slots, Jewel Action doesn’t have the classic ‘gamble’ option, but with everything else this game has got going on, you aren’t going to miss it one bit! From the gems, including rubies, sapphires, amethysts, emeralds and diamonds, to the Queens and Kings, which all pay out when you spin three or more, there are plenty of ordinary winning symbols to delight you as they fall on the reels. Spin three of any of these symbols on a winning payline and they will fall away, leaving the reels to spin and replace them – giving you more wins but without taking anything off your balance! The highest-paying combination, however, is 9 king symbols which will pay you x500 your bet! There’s More to Life Than JewelsIf you’ve enjoyed playing Jewel Action, then why not try out one of their table games, such as: Poker, Blackjack or Roulette. Different might be nice!